With GIS, students can see things in new ways. Students are encouraged to ask geographic questions, acquire geographic resources, explore geographic data, analyze geographic information, and act on geographic knowledge. Year-end projects are focused on the analysis of local or regional issues. Longtime Bangor High School geography teacher Margaret Chernosky's epiphany came nearly 10 years ago in an advanced placement (AP) human geography training course. "The instructor showed us some of the Atlanta [Georgia] demographic data in a desktop GIS, and I sat there completely enthralled. Completely. I realized that this is how you teach geography." Chernosky knew that to successfully integrate GIS technology into her own classroom instruction, she would have to first master it herself. Initially, she took online classes. Later, she attended training seminars in Colorado, Costa Rica, and New Zealand. "Besides being fun," says Chernosky, "the travel brought me into contact with people around the world that were equally enthusiastic about GIS. I'm still in contact with many of the people I met at the seminars. It's a real community." 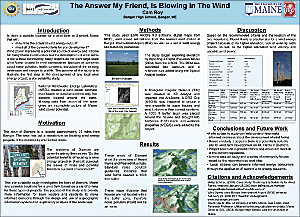 Bangor High School students created this poster and many more using geospatial analysis and ArcGIS. During this period, in addition to her full-time teaching responsibilities, Chernosky earned a masters of education degree in geospatial education. "My motivation was to not only learn as much about geospatial technology as I could but also to learn how to think geospatially. And this is what I try to bring to my students—this new way of looking at the landscape." Throughout this period, Chernosky had become familiar with ArcGIS software and Esri's training courses. When she introduced GIS to Bangor High School students in small steps, she assigned participation in Esri's Community Atlas project to her 2005 AP human geography class. Students and teachers throughout the United States annually contribute to the Community Atlas by examining aspects of where they live, then posting descriptions and maps of their community related to their findings. The following year, Chernosky proposed the addition of an elective class, GIS in geography, to the Bangor Area School District, which was subsequently approved. Today, because of strong student demand, two sections of the GIS in geography course are offered. While they are open to all students, Chernosky encourages sophomore participation so that those students can apply the GIS skills they have gained to their other high school courses, such as history and science. The maximum class size for the GIS course is 16 students. Because the classes have a limited number of students and the required projects that the students work on are completed in pairs, there is a great deal of interaction and cooperation among the students. Stacy Doore, a GK12 Sensor fellow, University of Maine, Spatial Engineering, has worked with Chernosky for several years to develop and teach the GIS in geography course. The five steps of geographic inquiry provide the basis of instruction that Chernosky employs in her classroom to direct her students in the creation and completion of GIS projects. The steps include the following: ask geographic questions, acquire geographic resources, explore geographic data, analyze geographic information, and act on geographic knowledge. She introduces the concepts gradually to the class, discussing articles found in ArcNews and ArcUser so that students can gain a greater understanding of the geographic inquiry method. Students complete two major projects during the year. The first is participation in National Geographic's annual Geography Action! program. Themes change each year and focus on either a location, such as Europe and Africa, or an aspect of physical or human geography, for example, conservation, cultures, and habitats. Chernosky tries to get her class to complete this project by mid-November in time for Geography Awareness Week. She has forged a relationship with the local newspaper, Bangor Daily News, and the editor publishes a full-page color spread highlighting the classroom work for five successive days. Says Chernosky, "We have a relatively small, close-knit community here in Bangor, and the newspaper is truly committed to education. In addition, the editor and I have developed a reciprocal relationship. When needed, I help him with graphics that require maps. For example, on election night I plot the results in ArcGIS Desktop in time for him to meet the press deadline for the next morning's newspaper." The students' year-end capstone projects focus on the analysis of local or regional issues that have a direct impact on the students themselves or their community. Chernosky initially holds a brainstorming session with the class, and they discuss local issues to develop the related geographic questions necessary to direct their projects. "Basically, we look for projects that are of local interest, deal with local concerns, and have relevant data available," explains Chernosky. "The majority of our data comes from the Maine Office of GIS. Its rich datasets are online and downloadable. From there, we get topographic maps, contours, rivers, roads—really high-quality, complete base files to work with. We acquire other required geospatial data from local agencies. Or if need be, we create our own data." The students have a variety of GIS software available to them, including ArcGIS, ArcGIS 3D Analyst, ArcGIS Spatial Analyst, ArcGIS Network Analyst, ArcGIS Publisher, and ArcLogistics. 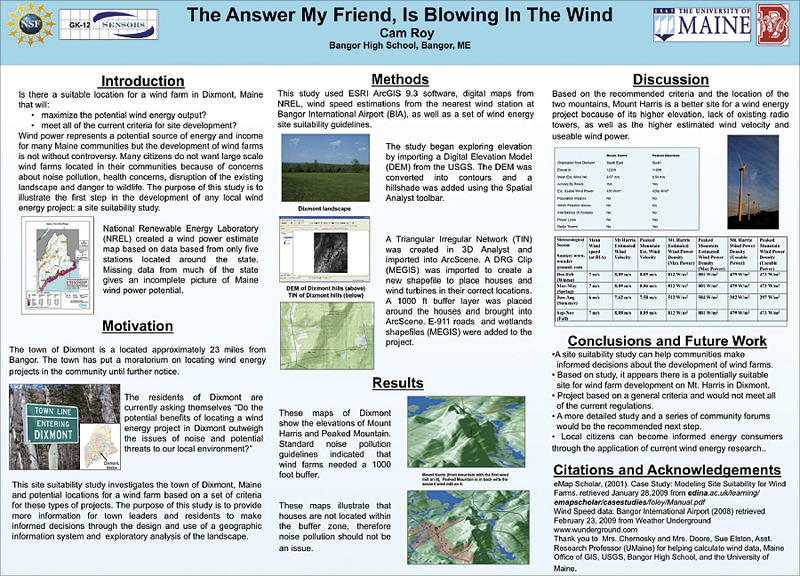 The completed capstone projects are subsequently entered into the Maine State GIS Championships, where the students personally present their finished work to the judging panel. In the 2009 contest, a sampling of the projects included "The Answer, My Friend, Is Blowing in the Wind," "Optimizing School Bus Routes," "Air Quality Monitoring in Penobscot County, Maine," "Determining Wireless Signal Using Indoor GIS," "Access to Health Care in Rural Maine," and "Cancer and Poverty in Maine." In 2010, students examined the temporal and spatial patterns of crimes to motor vehicles in Bangor. After the contest, students presented their work to the Bangor Police Department. Concludes Chernosky, "I'm not necessarily trying to convince my students to follow careers in GIS, though I believe there are many very exciting opportunities open to them. My goal is to get them to see things in a new way. I want them to really understand the spatial component of the steady stream of information bombarding their daily lives and how geospatial thinking can provide them with a greater understanding and awareness of the many things they will encounter. For more information, contact Margaret Chernosky, geography teacher, Bangor High School (e-mail: Margaret_Chernosky@umit.maine.edu).